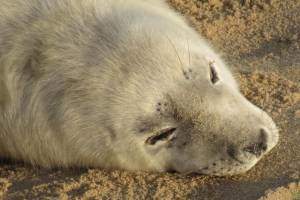 If your staying at Swallowdale on the Norfolk Broads between October and February, why not visit the Horsey Gap Seals and their pups. Once parked in the car park you can walk for miles along the roped off path overlooking the beach. The seals start having their pups early November and are normally on the beach until February. Horsey Gap is probably the best place to see the seals during the winter. During 2018/2019 winter there was in excess of 1600 adult seals and 1200 pups and numbers are increasing yearly. If you decide to take your dog along with you please keep it on a lead as the seals have a nasty bite if approached. In 2016 The Friends of Horsey Seals registered as a charity (Registered Charity Number 1169539). 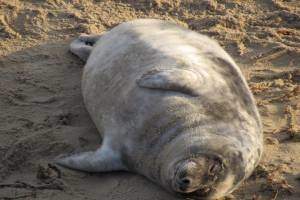 The group works to protect the grey seals at Horsey from disturbance by the public, especially during the late autumn and winter months when the seals are mating and giving birth. Horsey is a very small quiet village with only about 100 residents. During the summer months Horsey Gap is a magnet for families looking for a beautiful unspoilt sandy beach.